MelonDistrict Marina is the largest student residence hall in Barcelona and is a new concept in tourist accommodation, located very close to the Barcelona beach. We offer both double- and twin-bed rooms for daily stays, with a private bathroom, a free safe box, free wired and wireless internet and a cooking lounge where you can cook, socialize and relax. 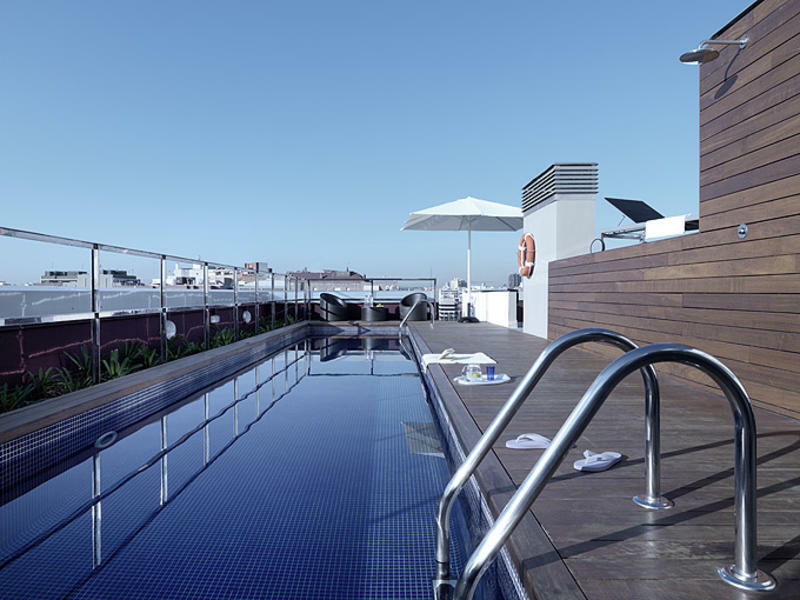 Not to mention our rooftop pool so you can enjoy the Barcelona climate during the summer. Rooms include a flat-screen TV. Short-stay rates also include sheets and towels. The multicultural environment of this place is a result of the international students who have lived here for long periods of time. We have 24hr reception with coin-operated laundry facilities. On the bottom floor of the residence, you can find the MelonCafe, where you can start off your day with a nice breakfast! Lunch and dinner are also available using the self-service or menu option, and there are beverages, sandwiches and pizza available all day. Spend some time there with friends, but if you are in a rush, you can get a snack to go. The café is open every day from 7:30am to 11pm. MelonDistrict Marina is located on Sancho de Avila 22, on the corner of Zamora street in the 22@ district, 10 minutes walking from Parque de la Ciudadela and 20 minutes walking from the beach. From the Marina metro stop, line 1 (red): the residence hall is 400 m from the stop. Line 1 connects directly with Plaza Catalunya and the Estacion del Norte, the station where the buses from the Girona airport arrive and depart. Take the Airbus in front of the airport terminal (leaves every 8 minutes from 5:30 a.m. until 12:00 a.m.) and get off at Plaza Catalunya. Go to the Catalunya metro stop on line 1 (red) in the direction of Fondo and get off at the Marina metro stop. Take metro line 4 (yellow) at the Barceloneta metro stop in the direction of La Pau and get off at Bogatell. Walk 6 minutes on Zamora Street until you reach Sancho de Avila Street. Take metro line 1 (red) at the Arc de Triumph metro stop in the direction of Fondo and get off at the Marina metro stop. Generally Ryanair buses arrive and depart from the Estacion del Norte.